Who says that you can't eat ice cream for breakfast? 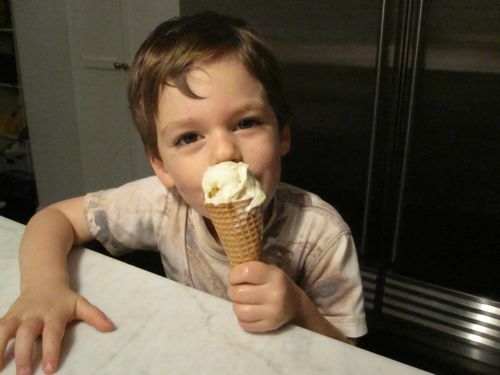 In our house, we eat ice cream any time of day. I'm not talking Haagen-Dazs or Ben & Jerry's. The reason ice cream is an anytime treat in our house is because we make homemade an Italian version of ice cream called gelato and ours contains no refined sugar. My husband goes to our local ice cream store at least once a week to get a cup of yogurt gelato, so we were inspired to make our own version using honey to sweeten it and giving it some added depth with cinnamon. It's heavenly and those are the only ingredients. Since this gelato is made with greek yogurt, it's high in both protein and calcium which are important for little ones and their growing bodies. So, whenever you want to give your crew a special treat that's also good for them, just head for the freezer, put a couple of scoops of this "ice cream" in everybody's bowls and watch the smiles light up light up the room. No matter what time of day. 2. Pour the yogurt mixture into an ice cream maker and chill according to manufacturers directions (I have a Cuisinart Supreme Ice Cream Maker and it took 30 minutes). 3. Place the mixture in the freezer to firm up, about 1-2 hours. *If you don’t own an ice cream maker, no worries, this mixture can be poured into popsicle molds and frozen for 6 hours or longer. I looove this recipe and am dying to try it out.. Just wanted to confirm if the same can be made using homemade greek (strained) yogurt ? Thnx ! i looooove this recipe, and wish to try it for Emaan. however, wanted to know if i can use greek yogurt (strained curd) made at home for the same ?? any tips / suggestions ? This is SO good! I don't have an ice cream maker (on my list!) but I have been mixing pureed fruit into greek yogurt with a little agave and freezing it. Whenever I want ice cream for the boys, I give it a whirl in the mini food processor with a teeny bit of milk to smooth it out. It makes a soft serve frozen yogurt which is awesome. I have 2 1/2 year-old twin boys who are much pickier than your Kenya - but they will eat this any time! Thanks for sharing the recipe. We thought of making it our first go at making homemade ice cream. In the recipe you stated to follow the manufacturers directions. The manual for our ice cream maker said to follow the recipe. So we are a bit lost on how long it should take and how do we know if it's done. Thank you so much. I was wondering if you had the nutritional information.